Hey! I would like to start by introducing myself. My name is Patricia and I’m a party stylist and blogger at Hello Eventos in Spain. 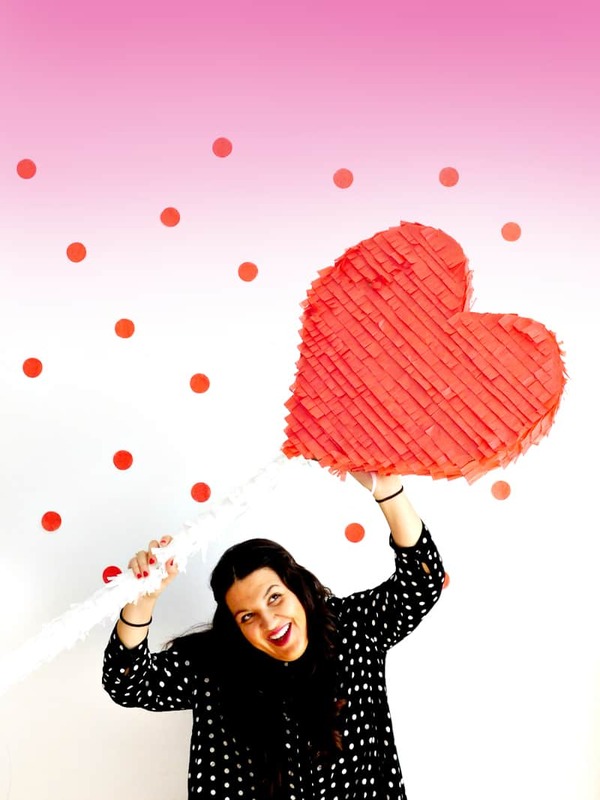 Let me tell you that I’m super glad to be on Bespoke Bride today and even more for a Valentines Day DIY piñata! As a party lover, I’m crazy for the day that we celebrate LOVE and every year I do something special for my valentine. This year I was thinking of creating a piñata and what’s better than a heart lollipop?! Heart lollipops are one of my favorite treats. I filled the piñata with lots of them and can’t wait to open it back up and share all of the candy! Let’s do it! First we need to shape the heart so cut 2 cardboard hearts and 2 stripes out of your cardboard. Hot glue the stripes to the first heart. Leave 10cm of the bottom end of one of the stripes without glue because this will be the door way for the candies. Next, hot glue the second half on top. Using your glue gun, adhere the cardboard tube to the bottom of the heart then cut the word LOVE out of the cardboard. Fix the rope or lace to the inside of the door way and attach the word LOVE at the end of the rope. Fill the piñata with confetti and sweets then close the door with adhesive tape. Now we have the structure ready, let’s dress it up! Cut the crepe paper into stripes of 4 cm width and fringe them. Then, start dressing up the piñata from the sides of the heart. It’s always best to start from the bottom and work your way up. Next, start dressing up the piñata on the sides of the heart, again starting from the bottom. Cover the front and back of the heart and the letters love. Use the white paper to cover the tube. And then you are ready to enjoy it! !